SQL Server Error 18456: Know How to Fix? When trying to connect to Microsoft SQL Server encounters you with an error 18456 that probably points towards authentication issue. This could be because you don't have enough rights or the credentials used are not correct. Therefore, this piece of segment shares information about SQL Server Error 18456 along with the consequences of it and the possible fixes that can be applied to it. The failure encountered during a login performed on SQL Server, at most times, means that the server successfully received the connection request mentioned by you however; it isn't able to give you the access. This condition is caused by a number of possible reasons. Technically any error is converted to a state 1 error unless the server logging is checked, thus, the same happens with the discussed eventID too. Unfortunately, Microsoft doesn't offer error messages that could be useful. Therefore, below given are some of the possible explanations on the whys and wherefores of the SQL Server error code 18456. A possible cause to this condition could be any ranging from disabled userID on the server or password expiration probably caused the issue. If the connection is being established through SQL Server authentication method, then it is necessary to verify whether the server has been configured in a mixed authentication mode or not. If the connection is being made via SQL Server Authentication, make sure that the server login exists and it is being correctly typed out. With connection made via Windows Authentication, it is advised that the user ensure a proper login made to the correct domain. Other than the above stated measures, you are requested to contact the SQL Server administrator when an error reflects state 1. Repeatedly trying to log into the Server with the SQL Server Error 18456 being reflected as an output of no authentication or misspelled credentials could lead to permanent block out from the account. 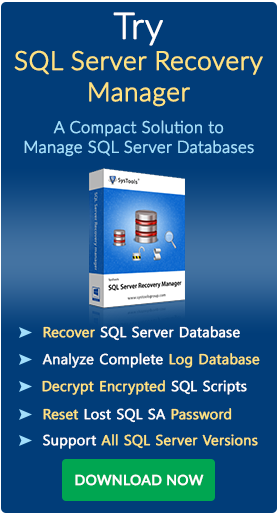 So it is better to use SQL password recovery tool to remove password from SQL Server Database.